This was the 25th film I saw at the pre-Tribeca screenings and it restored my faith in the movies. Here was a movie that managed to surprise me, entertain me, inform me and make me think. More precisely this is one of the best films of the festival. Beginning with a long tracking shot of wine casks to the sound of Joss Stone and Jeff Beck performing I Put a Spell on You, this film grabbed me and never let me go. A near perfectly constructed film that begins with the story of the land and the grapes that produce wine in general and then moved outward to tell the story of the history of French wine, it's shift from drink to investment commodity and it's sudden place of honor in the Chinese psyche. Its a film that takes you along on a journey and is forever opening up new doors to enlighten and inform. The way the story is told is painfully simple and the sort of thing that most documentarians never manage to get right, telling you the "whole" story in away that moves you along from start to finish and making you realize how much you didn't know even though you thought you did. One of the delightful things about the film is that the film is about so much more than just wine. Not only do we get some of the history of France and China, but we get a cautionary tale about how something can end up becoming potentially over priced by those wishing to corner the market (think the legendary tulip and comic booms and busts). I had gone in expecting to see a film about how the Chinese are buying up France's wine production and instead found something much more expansive. I love it when a film exceeds and confounds my expectations and this film did just that. The small blurb that is in the Tribeca booklet quite honestly doesn't do the film justice since it promises one thing and instead delivers another. Not only didn't I expect the wide reaching discussions, I also didn't expect the film to look and sound as good as it did. Frankly I'm so glad I was sitting in the front row when I saw it because the images made me feel as if I went to France without leaving Lower Manhattan. I think the point at which I realized that I had found something special was during a sequence where people were discussing how they experience wine, how the physical sensations of drinking are momentary and fleeting and how it's mostly something that lives on in one's memory. There is one gentleman who begins to compare wine to music. There was something about the analogy that made me realize just how special this film is. One of the best of Tribeca and one of my favorite films of the year. 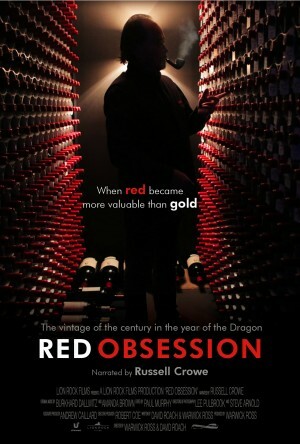 And yes even if you don't like wine, I don't drink, you'll like this wonderful film.